A stereoview photographic print consisting of two colour tinted black and white images that have been taken simultaneously. The prints have been mounted next to one another on a card. The images show two girls playing an upright piano and a woman seated behind the girls watching them play. The woman holds a book in her lap. The woman and girls wear dresses with full skirts, the girls dresses have been tinted purple and maroon, while the woman's dress is green. (Stylistically these dresses appear to date from mid-nineteenth century ie 1840s.) The furnishings in the room have also been tinted, with the chairs and foot stools in red and the picture frames gold. The photographer's details are printed on the front of the card. Handwritten initials can be seen on the back of the mount. Printed text on the mount reads 'Groupes de Genre' and 'Photographie C.G. a Paris.'. Handwritten initials on back of mount 'DBA'. The stereoview was published by Photographie C. G. a Paris between 1860 and 1890. A stereo photograph is comprising two photographs, one taken as the left eye sees the view and another slightly offset as the right eye would see a view. These photographs are mounted on a card which is then fitted into a viewer. The viewer allows the brain to superimpose the two images, imitating the three dimensional stereovision of the human eye. 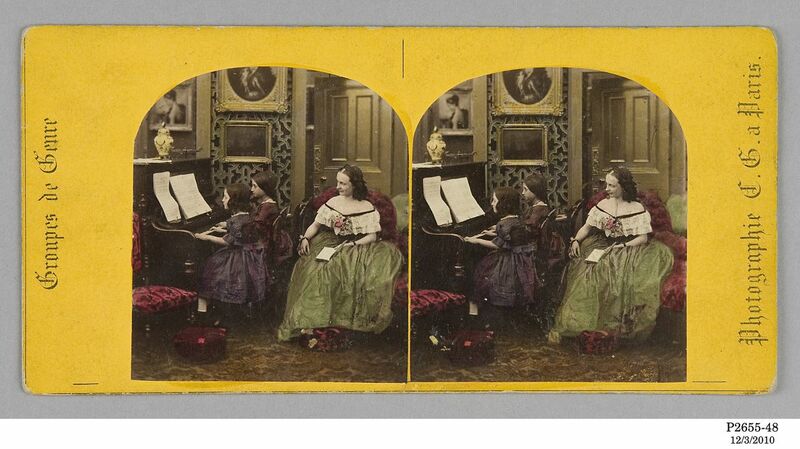 Stereo photographs are essentially the combination of two inventions of the 1830s. Sir Charles Wheatstone announced the first of these in 1838; it was an optical viewer that could combine two specially developed three-dimensional drawings that took into account the slight variation between the right and the left eye. The second occurred in 1839 when two different photographic processes, the 'daguerreotype' by Louis Daguerre and the 'Talbotype' or 'Calotype' by Henry Fox Talbot, were announced to the world. In the 1840s Sir Charles Wheatstone began experimenting with Talbot's process which enabled him to place two slightly offset photographic images in his viewer. The success of these experiments inspired a Scotsman, Sir David Brewster, to announce in 1849 his modification of the stereo format, a portable viewing device called a lenticular stereoscope. It was Brewster's stereoscope which defined the standard for the new format and which was popularised from the early 1850s.